The worst TV game of all time, hands down. I am a HUGE fan of TV games. Ten or fifteen years ago there was a rash of vintage games brought back to life via single joystick consoles that connected direct to the TV via A/V ports. They made Atari 2600 games, Intellivision games, and old arcade games. There were retro-inspired originals and I even had a Chinese bootleg unit that played some of the NES classics. These units took batteries and were totally awesome in many respects. This TV games trend lasted for a while, and it wasn’t until a few years ago that the craze seemed to fizzle out. There are still a few out there that a touch more advanced these days such as the Atari Flashback series (that has become pretty advanced). Today finding some of the old TV games is kinda hard. They go for good money on Ebay, I saw one of the C64 sticks for over $100. Needless to say, I was excited when I saw an unopened TV game called COLECO Video Game System at my local Goodwill for $2.99. I bought it without a second thought. That was perhaps a mistake. I want my $2.99 back. 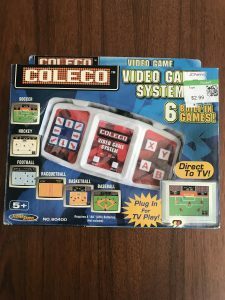 When I saw COLECO Video Game System on the Goodwill shelf and saw that it has SIX sports games, my memory went back to the early 80’s when I owned a Coleco Adam computer. The Adam was just a souped up Colecovision game system with a tape drive, keyboard and printer. I remembered playing Colecovision sports games like Baseball, and Summer Games–really good games back in 1984. I thought that the COLECO Video Game System would be Colecovision sports games… I was wrong. The package makes this look appealing, it’s not. Whoever made the COLECO Video Game System must have either been on a tight budget or just the type of person who hates fun. This thing is a combination of the worst qualities of the vintage video game era with none of the charm. Colecovision sports games? No way! These are like portable LCD games ported to a TV screen. It’s hard to believe that anyone would do that for any reason at all. It’s like selling tickets to a five second animated GIF that’s showing on an IMAX screen, it’s pointless and a waste of space. You need to play these games to believe how boring they really are. Racquetball is the most exciting and that’s because it’s a PONG derivative–not a fun one. The players in the games like Soccer and Basketball are STATIC, you just highlight them (just like an LCD game). I imagine that these were ripped right off of some of the old Coleco handhelds of the late 70’s and very early 80’s. Those games were fun in LCD format and for their time, but they are NOT fun on a TV, they feel limited as crap. I can’t say enough about how bad these games are (all six of them) but I couldn’t spend more than two minutes on any of them before I felt like I was wasting my life. Besides the fact that the games are virtually unplayable, the controller is incredibly awkward. It’s a square with directions on it that’s about as ergonomical as an iron maiden. Along with the discomfort is the fact that it’s not responsive at all either. the four buttons (that I still can’t figure out how to use in games) are situated in a way that makes sure you can’t use them even if you knew how. All in all the best feature of the controller is the OFF switch that ends the torture. 1.) 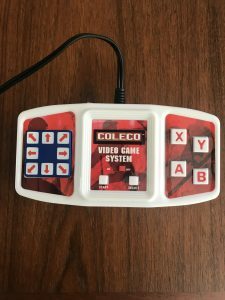 Colecovision games were too expensive to licence (although I can’t imagine why since Coleco went belly up thirty-something years ago), so they people who made this went for the set of games they could afford: the LCD Coleco Games. 2.) The development team was made up of former Nazi scientists who wanted revenge for their loss in 1945. 3.) Someone, a crazy person, thought these games were fun and needed to be ported to TV. 4.) This unit is an inside joke between some engineers and developers who are laughing their asses off. 5.) Rather than doing any marketing research this unit was developed by a group of executives in a board room that had gone loopy due to a malfunction in the ventilation system that deprived their brains of oxygen. What more can I say about how much I hate this thing? Don’t any of you dare to buy this online for ten bucks, or whatever it costs, it’s not worth it. If you want the same experience for free go find a blank wall and stare at it for two hours, then poke yourself in the eyes and repeat until you can’t take it anymore.